Never has the desire to and need for remote communication been more pressing or important than it is today. Over 80% of teams have at least one member not physically located with the rest of the group. And the number of employees who telecommute is increasing steadily. And while communication is complex enough to start with, when we are doing it at a distance, even more barriers arise. Remote leaders have numerous technology options and tools available, and it’s absolutely vital to select the right one for the situation. But it doesn’t stop there. After you’ve chosen the tool, you and your team need to know how to actually use it. 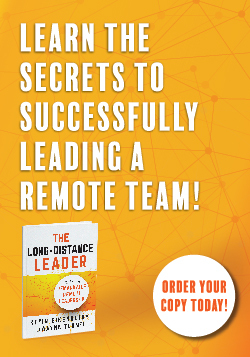 Remote leaders must also be vigilant about building trust and creating opportunities for collaboration. Without the incidental and daily interactions that co-located teams experience, you can’t take communication for granted or just let it happen. The list goes on…Setting clear expectations, coaching and giving feedback successfully, dealing with the unknowns of a virtual workforce…. And being successful in any and all of these situations relies on one very important skill: communication. Effective communication is absolutely vital to the success of you and your team. And in this powerful webinar workshop, best-selling author and Master Trainer, Guy Harris, and Wayne Turmel, co-founder of the Remote Leadership Institute, are joining together to show you exactly how to be more successful in all of your communications. They’ll introduce and explain a simple model that will profoundly impact your remote team, increasing communication and trust, as well as collaboration and productivity. The DISC model is truly a map to understanding human behavior. And when you know how to use it, you can tailor your communication so that you see other peoples’ behaviors through the filter of their needs – and this drastically increases your ability to effectively connect and communicate with others. You’ll learn the different DISC assessment results and how to apply them to each member of your remote team. You’ll gain insights into each communication style, and how you can adjust your approach in order to more effectively communicate and connect with others. If you are a leader with people spread across geography and time zones, the communication skills you will learn in this session will change your leadership life. Join us now to have less stress and frustration, and more success! This 120-minute webinar workshop is a small group experience – the class size is capped at 10 participants to allow maximum interaction and learning. Course includes a pre-class assessment, copies of the course visuals and a PDF, re-printable, packet of planning tools they can use in the future.